Lovely hamper includes package of 5 days celebration 1st day : 10 red carnation bunch with 2 cadbury Perk chocolate bars (Rs. 10/- each) + 2nd day : 5 orchids bunch with 100 gms cadbury's Eclairs chocolate packet + DAY - 3 : 10 yellow gerbera bunch with 2 cadbury Five Star chocolate bars (Rs. 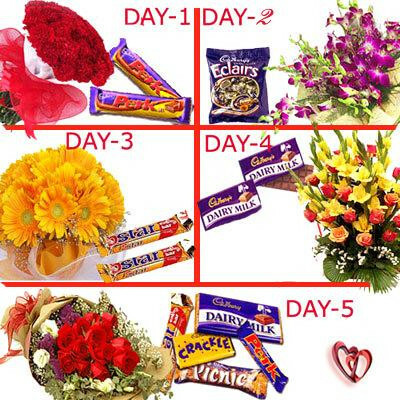 10/- each) + DAY - 4 : 10 mixed flower bunch with 2 cadbury dairy milk chocolate bars (Rs. 10/- each) + DAY - 5 : 10 red roses bunch with Assorted Chocolate Bars . Awesome hamper to make ur love feel how much u love.